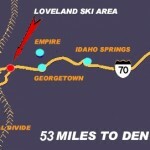 Loveland Ski Area is Colorado’s best ski and snowboarding resort, just minutes from Denver. Enjoy the best snow, snowboarding, skiing, ski season passes, ski schools & Loveland Ski Area events at Colorado’s premier ski and snowboard resort. No matter what you like to ski or ride, it’s all right here at Loveland. And it gets covered with an average of 400 deep inches of snow a year. So you’ll have plenty to love at Loveland, from October through May. All dining options are located within Loveland Ski Resort. Loveland sits atop the Continental Divide and is just a short 53 mile drive from Denver. While Loveland has varied terrain for every ability, Loveland Valley provides beginners and first timers with a separate base area and gentle slopes perfect for learning how to ski or ride. Loveland Ski Area first opened its slopes to skiers back in 1936 when J.C. Blickensderfer installed at tow at what is now called Loveland Basin. The following season Al Bennett continued the operations by using a Model T engine for power. 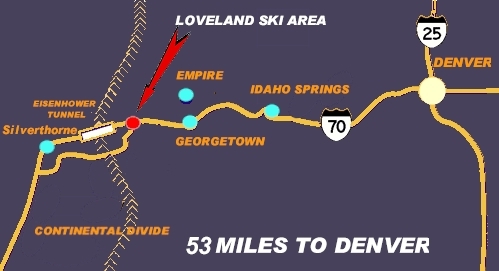 In 1941, the area was officially named The Loveland Ski Tow Inc. By 1948, four ski tows were in use and they were logically named A, B, C,and D. The next decade would bring big changes to the area. In 1955, the business was sold to group of stockholders who employed Pete Seibert (10th Mountain Division Member) as the general manager. Seibert would later build the Vail Ski Area in the early 1960’s. Heron Engineering was contracted to install Loveland’s first ski lift in 1955. It was named Chair 1, and has the same line as the current lift. The following season, Chair 2 was built. The lift began near the slope maintenance building west of the current Basin Lodge. By the late 1950’s to 1960’s construction began of the Dwight D. Eisenhower Tunnel, which runs directly below the base of Chair 4. During this time period, Chairs 3 and 4 were built also by Heron Engineering. This opened the Loveland Valley Ski Area in 1961 as well as some south-facing slopes to the north of Chair 2 in 1965. During the 1980’s, Loveland upgraded the old Chair 2 with a high-capacity Yan triple chair. This provided better, more reliable access to beginner and intermediate terrain. In 1989, a new Valley lodge was constructed, allowing for better guest services at the beginner and racing hills. Loveland continued its expansions during the 1990’s. In 1990, Yan was contracted to install Loveland’s first fixed-grip quad. The lift serves intermediate and expert bowl terrain to the right of Chair 4. Due to increased skier numbers, in 1995, Loveland decided to enlarge the Basin lodge to its current size. This drastically increased the number of people the building could accommodate. The following year, chair 3 was replaced by a Poma quad chair, doubling the lift capacity at the Valley. During the summer of 1998, Loveland received approval from the Forest Service to install a quad chair to the summit of “The Ridge.” Original proposals called for a surface lift, but due to the large amounts of snow the area gets annually, a tram lift was the best option. Poma of America engineered and constructed this quad chair. Loveland is currently studying expanding the Valley by adding an additional quad chair to the left of Chair 3. This would provide more trail options here. Another possible expansion area is to the right of chair 8, but access to this area is remote and would require another base area.